Flat Iron Experts sent me this hair straightener for review on my blog. 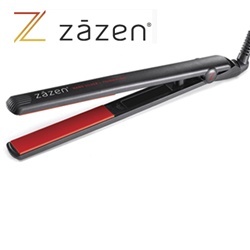 I got to try the Zazen Nano-Silver tourmaline and ceramic flat iron. The iron normally costs $170 but is on sale for $125!! The iron is great quality and straightened my hair in minutes. It is easy to use and your hair does not get caught in the straightener like with many other straighteners. Many of the products are on a great sale too that is cheaper than at other stores. Also, on their site, if your purchase is over $100 you get three free items including a travel iron! The company also sells blow dryers, curling irons, brushes, etc. You must check out this site...it's great!